The 2012 NFL season is only a week old, but we’ve already been treated to a couple of classic fan brawls. First, and still foremost, there was the brawl during the game between the Jets and Bills at MetLife Stadium—you know, the one where the dude punched a girl in the face. And now we’ve got some pretty good footage of a brawl at the Raiders-Chargers game this past Monday. 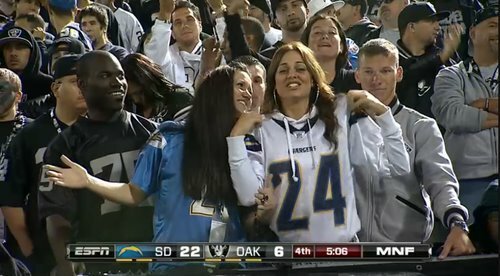 But contrary to what you might expect, it doesn’t look like this brawl was between Raiders fans and Chargers fans. I say “contrary to what you might expect,” because Raiders fans have a reputation as a pugnacious bunch, and also because Chargers fans themselves don’t exactly keep a low profile when visiting their Northern California rivals. 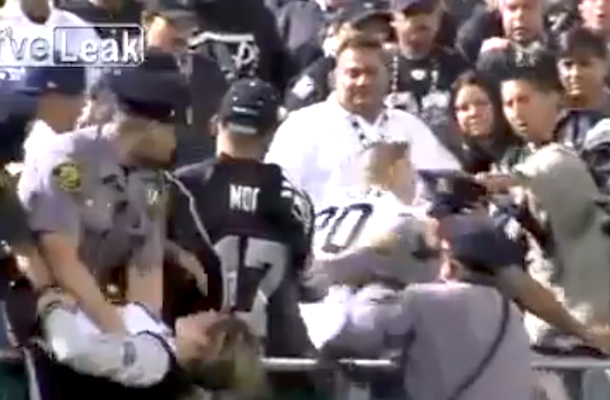 Nevertheless, it looks like everyone involved in this melee is from Oakland—including the small blonde woman who beats an officer with his own handcuffs, as well as the enormous man in the Howie Long jersey who can dish it out but can’t take it. Now, as much as I enjoy watching the aforementioned blond chick resisting arrest (they make ’em feisty in Oakland, don’t they? ), I have to say that my favorite part of the video is watching the security guard gently beat the brawling fans with his baton. Keep up the good work, Barney Fife.